Great Britain's men and women have been drawn in the same group as Brazil at the World Gymnastics Championships being held in Glasgow later this year. The men's team also have Puerto Rico in their section while a mixed team will feature in the women's grouping. The event will run from 23 October to 1 November at the Hydro, which hosted gymnastics during the Glasgow 2014 Commonwealth Games. The Championships also double up as Olympic qualifiers for Rio 2016. Five-time Olympic gold medallist Nellie Kim, who earned two perfect 10 scores during the 1976 Montreal Olympics, made the draw and will return to Glasgow as one of the judges at the World Championships. "With 615 gymnasts competing from 91 countries this will be the biggest world championships," she said. "Adding the sport is huge in every corner of the world, with some countries competing at the worlds who've never competed before." 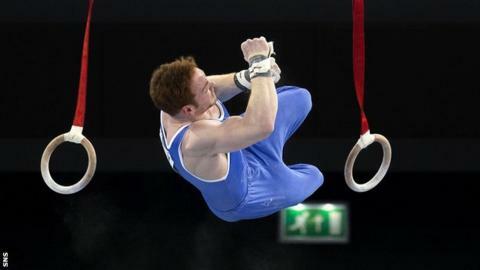 Scot Dan Purvis, who won a gold and a silver at Glasgow 2014, is likely to be in the British team. And he said: "The British men's squad are out in Portugal training hard with Glasgow the big target for all of us. "The Commonwealth Games last year was an incredible experience and the crowd can once again make the difference for us at the World Championships as we aim to make everyone proud and get Team GB to Rio. "The men's squad is full of world class gymnasts and we all want to be there at the Hydro on 25 October competing for our place at the Olympic Games."